'Tis the Season to be Jolly... and perhaps pick up a book for the sports fan on your shopping list. This week I've got the perfect book but unfortunately, people won't exactly have visions of sugarplums dancing in theirs head once they finish reading it. In fact, I broke down in tears after reading Breaking Away by Patrick O'Sullivan, with esteemed Canadian author Gare Joyce lending a helping hand to the project. O'Sullivan played eight seasons in the National Hockey League and was a huge OHL star, putting up a pile of points for the Mississauga Ice Dogs. He also scored the winning goal for Team USA against Canada at the 2004 World Junior Tournament. But don't hold that against him because, to be honest, it's amazing Patrick was able to keep his sanity to play elite hockey. Breaking Away, you see, tells the sad and sordid tale of Patrick's sick and twisted father, John O'Sullivan. A frustrated low-level minor pro, the senior O'Sullivan decided to live his hockey dream through his more talented son –­ and the results weren't pretty. 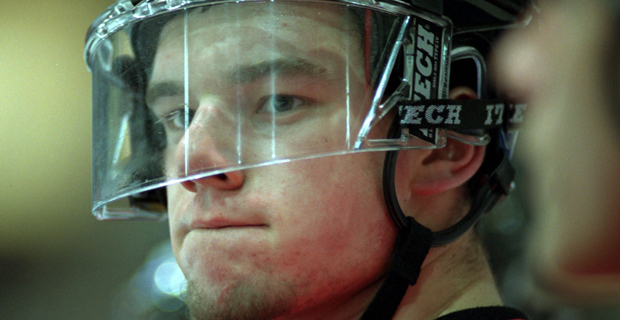 From the age of eight, Patrick lived a minor hockey nightmare that included his father punishing him for perceived poor play by booting the little guy out of the car after games and forcing him to run beside the vehicle; sometimes even taking off and leaving his young son to run all by himself down a cold and lonely abandoned road. Other atrocities include his dad waking him up in the middle of the night and forcing him to do push-ups and sit-ups until he could barely breathe. In an attempt to make his son bigger and stronger, his father force-fed Patrick super-sized meals that his small stomach just couldn't digest. Another time, upset over Patrick vomiting up his meal, John forced him to eat the vomit and, when Patrick threw up again, insisted he keep eating the vomit until his son was finally able to keep everything down. Folks, this is just an example of some of the horrors Patrick O'Sullivan had to endure from his own flesh and blood on the road to the NHL. But unfortunately, by the time he realized his NHL dream, O'Sullivan was so traumatized by his father's treatment, including physical abuse, that he never realized his full potential and ended up quitting hockey at the tender age of 27. However, just like old Ebeneezer Scrooge escaping his Christmas ghosts on the road to redemption, the younger O'Sullivan is also on a bright new path. Immediately after reading Breaking Away, I hopped on my computer and began exchanging messages with Patrick. "You had a great hockey career, especially with what you had to go through," I wrote. "But I really believe you're going to accomplish even bigger things in your post-hockey life." Patrick agreed, and I'm happy to report he's well on his way. O'Sullivan has just hired a consultant to help him in his quest to set up his own foundation to address the issue of over-the-top parents who mess with their children's dreams. Minor hockey, of course, will be a huge focus of the program but, as Patrick points out, bad parents can also push their kids too hard in everything from school performance to dance class. Patrick O'Sullivan is now 30 years old, a married man with two young sons of his own as he starts the next chapter of his life in Naples, Florida. So, what does he wish for his own kids? "I just want them to have fun," said O'Sullivan. "Parents need to realize they can't force their own dreams on their kids. I want my sons to find their own activities and passions, and whatever they choose to do, I'll be there to support them." And if you want to support a young man who has survived an unbelievable ordeal, and get educated on the problem of parents pushing and abusing their children, Breaking Away by Patrick O'Sullivan and Gare Joyce should be at the top of your Christmas list. No, it's not a festive read. But I guarantee it's definitely a vital one.